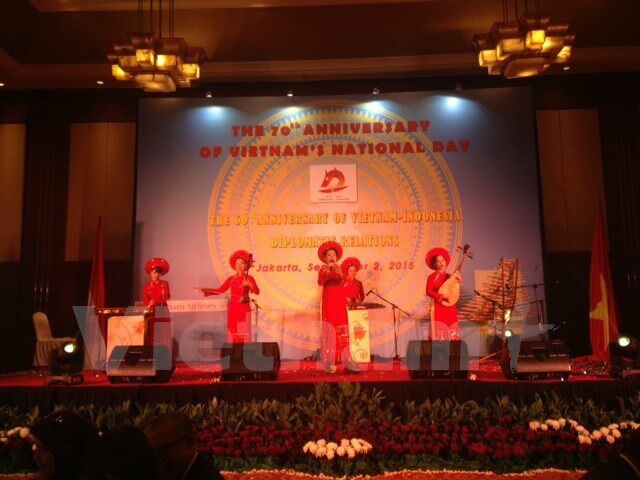 (VNA / VIETNAM +) – At September 2, at Hotel Borobudur in Jakarta, Ambassador Extraordinary and Plenipotentiary of Vietnam to Indonesia Nguyen Xuan Thuy and Ambassador, Head of the Permanent Mission of Vietnam in ASEAN Nguyen Hoanh Year celebrated 70 years anniversary of the National Day of the Socialist Republic of Vietnam (2/9 / 1945-2 / 9/2015) and 60 years of diplomatic relations between Vietnam-Indonesia (1955-2015). Attending the ceremony were about 400 guests representing the Parliament, Government, ministries of Indonesia; Ambassadors of representatives of delegations, international organizations in Jakarta, representatives of the Diplomatic Corps and many overseas Vietnamese, officers, employees Vietnam is working in Indonesia. Speaking at the ceremony, Ambassador Nguyen Xuan Thuy confirmed great significance of the August Revolution, the National Day 2/9 and praiseworthy achievements that the Party, State and people of Vietnam has achieved in his career struggle for national independence, protect the country and the innovation, development of the country. Ambassador stressed the spirit of unity, cooperation and is willing to become an active member of the international community, Vietnam has gradually gained significant achievements in the development of socio-economic anddiplomatic relations. Vietnam also made 5/8 Millennium Development Goals of the United Nations and achieve middle income status by 2010. Vietnam has successfully implemented open-door policy to become an active member of ASEAN and accountability, as well as regional organizations and other international as ASEM, APEC and the WTO. In the ASEAN region, Vietnam has established strategic partnerships with four neighboring countries, contributing significantly to promoting the building of the ASEAN Community. In addition, Vietnam is another attraction of foreign direct investment (FDI) with a total registered FDI reached about 257 billion dollars. Vietnam is willing to international integration deeper and more substantive. Cultural performances in the 70-year anniversary of the National Day September 2 in Indonesia. Ambassador Nguyen Xuan Thuy stressed in 2015 was a special year for Vietnam and Indonesia, the two countries celebrate the 60th anniversary of diplomatic relations established by President Ho Chi Minh and President Sukarno laid the foundation and is nurtured, developed by generations of leaders and people of both countries. Ambassador confirmed the commitment of the Government and people of Vietnam will continue to do their best to bring the relationship to a higher plane of friendship new strategies, for the benefit of the two peoples and contribute to building solidarity ASEAN strong and growing. Ambassador stressed Independence anniversary in Indonesia 09/02/2015 special significance at a time when important because the two countries celebrate the 60th anniversary of the establishment of diplomatic ties Vietnam-Indonesia (30/12 / 1945-30 / 12/2015) and expressed the firm belief of friendship relations and cooperation between the two countries will continue to be strengthened and expanded in the future. Speaking at the ceremony, Minister of Law and Human Rights of Indonesia Yasonna Hamonangan Laoly had speech congratulated 70-year anniversary of the National Day of the Socialist Republic of Vietnam and the 60th office diplomatic relations Vietnam-Indonesia. Ministers expressed their pleasure at the friendship and traditional cooperation between the two countries good on all the fields of politics, economy, culture, education, humanitarian, … as well as the traditional area of ​​cooperation positive and mutual support in international fora and the Asia-Pacific region. The Minister believes the traditional friendly relations and a strategic partnership between the two countries will increasingly be expanded and developed for peace, stability and prosperity of the region and the world. On this occasion, the Embassy of Vietnam in Indonesia also held a photo exhibition of 60 years of diplomatic relations between Vietnam-Indonesia, introduced the history of recorded images of the milestone in bilateral relations. The ceremony took place during the anniversary insistent solemn atmosphere, cozy and friendly with excellent art program, imbued with national identity and the traditional dishes of Vietnam … leave a good impression on many with a large number of international friends as well as the Vietnamese community work, study and live in Indonesia. 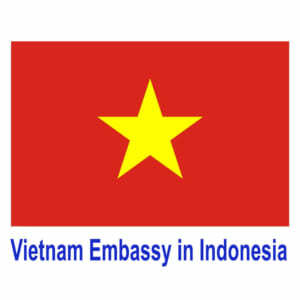 Do Indonesia citizens need a visa to Vietnam?